Hi! My name is Bailey & I am a junior studying Mathematics. I love numbers, yoga, cooking, & of course, THON! I have been involved in THON since my freshman year. During freshman year, I was on a Rules & Regulations committee. Last year, as a sophomore, I was on a Dancer Relations committee. As a Dancer Relations committee member, I saw how important those 46 hours that the dancers stand are to our mission. Their strength was inspirational, and has since inspired me to try to dance myself! It has been so humbling to be a part of THON. The way THON brings the Penn State family together to fight for the THON kids is such a beautiful and inspiring thing. I THON so that no family has to feel a missing piece. Hi! My name is Kiera & I'm a junior studying Actuarial Science. It's been my dream to attend Penn State ever since I was 5, and my time here so far has been nothing short of amazing. 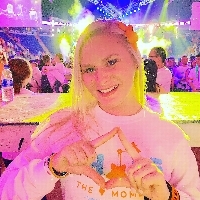 Over the past two years, I have become really passionate about THON and its mission. Last year, I had the privilege of being on a Rules & Regulations committee. I was able to see all of the hard work that goes into THON and it made me love the cause even more. 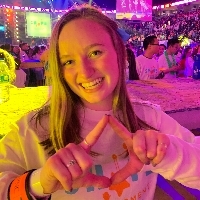 I would love to be a dancer for THON 2019 so that I can give everything I have to an organization that has given so much to me. THON has given me the ability to be a part of something so special and bigger than myself. I am inspired every day by the kids and families of THON. I THON so that one day, we will be able to say we live in a world without cancer. Join us in our commitment to turn childhood dreams into reality by supporting THONTM. Together, Bailey Hakala and Kiera Pawlikowsky, are taking action by uniting with 16,500 student volunteers and over 25,000 alumni supporters in the fight against childhood cancer. Our year-long efforts culminate in a 46-hour, no-sitting, no-sleeping dance marathon each February to celebrate our survivors, remember those we’ve lost, and take a stand--all in hopes of one day dancing in celebration of a cure. Please consider helping us reach our goal, so that we are able to do everything we can For the Kids. Any donation truly makes a difference. We would like to extend an enormous thank you on behalf of ourselves and the THON community. Bailey Hakala and Kiera Pawlikowsky have been working tirelessly all year with the hopes of being selected to dance in THON 2019. Independent Dancer Couples are dedicated individuals who set up their own fundraisers throughout the year, and with the support of friends and family, will obtain tickets in a lottery system in the hopes of earning a spot as dancers in the Penn State Dance Marathon. With your contribution, you will bring Bailey Hakala and Kiera Pawlikowsky one step closer to being able to take a stand against childhood cancer during THON Weekend 2019.